Renowned British physicist Stephen Hawking has pulled out of a June conference hosted by Israel’s President Shimon Peres, joining an academic boycott of the Jewish state, event organisers said on Wednesday. “Hawking joined the academic boycott of Israel and pulled out of the Israeli Presidential Conference: Facing Tomorrow 2013, under the auspices of President Peres,” they said in a statement. The British Committee for the Universities of Palestine (BCUP), which supports the academic boycott of Israel and opposes its occupation of Palestinian territories, said Hawking had decided to observe the boycott and as a result had “declined his invitation.” “This is his independent decision to respect the boycott, based upon his knowledge of Palestine, and on the unanimous advice of his own academic contacts there,” it said on its website. Britain’s Cambridge University, where Hawking has worked since 1962, confirmed he had pulled out, but initially said it was for health reasons. “Professor Hawking will not be attending the conference in Israel in June for health reasons — his doctors have advised against him flying,” a university spokesman told AFP. However, BCUP later confirmed Hawking had endorsed its statement that his reason for pulling out of the conference was indeed a boycott. “The statement above has been issued with the specific endorsement of Professor Hawking’s office,” it said in a statement added to its site. Whatta schmuck. For someone who’s known as such a genius, he’s actually a moron when it comes to reality. I have Stephen Hawking’s books in my library. Maybe I should burn them. Clearly, he’s replaced his vast store of scientific knowledge with the backward jihadist rantings of koranic verses. His book, “A Brief History of Time,” needs a sequel because history and time get more and more brief the more people embrace jihad. Score another one for 13th Century “civilization.” Hawking hu Schmuckbar. As George Orwell observed, some ideas are so ridiculous, only intellectuals believe them. I’ve been told PhD stands for Piled Hip Deep. He is one more FREAK… a FOREIGN FREAK. He hasn’t done anything for decades. Good riddance. Another example of someone who’s book smart and no common sense. Winston Churchill a man unfortunately more prescient than most people were capable of acknowledging both then an now. He may have overestimated the protection which modern science provides but perhaps he felt the fragility of it even then. Maybe Hawking will boycott Cambridge and return all the decorations he received from the Queen because of the illegal English occupation of Gibraltar, Northern Ireland, Scotland and the Falkland Islands. What do you expect from a militant atheist? I trust that Mr. Hawking made NO use of Albert Einstein’s discoveries in relation to his works. I also trust that he used NONE of the scientific knowledge passed down through the ages by Jewish physicists, astronomers, etc. Mr. Hawking has been described as a “Genius,” and has been decorated by the Queen. The Beatles and other pop stars have been called “Genius” and have been decorated by the queen. 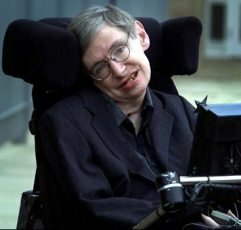 Hawking is in “fitting company.” Goethe’s famous quote surely applies to Hawking: “There is nothing more frightful than ignorance in action.” As for “Genius,” the best genius story is as follows: Some years back, Andre Watts was to perform one of Mozart’s Piano Concertos in a concert that evening. In the morning, Watts was interviewed on a local radio station. The interviewer heaped praise after praise upon Watts, finally describing him as a “Genius of the keyboard.” Watts immediately cut him off, stating, “No. MOZART was a genius….I’m just a piano player.” So it goes……. Actually, Hawking radiation is also called Hawking-Bekenstein radiation named after the physicist Jacob Bekenstein, because it was Bekestein who first came with the concept of entropy of a blackhole. Additionally, Hawking did not even agree with Bekenstein’s black hole analysis until he began to actually do some work and research to understand Benkenstein’s groundbreaking work. Then, and only then, did the moron Hawking recognize that he was wrong and that Bekenstein was right. This is yet another reason why anyone who thinks that Hawking is a genius is ill informed, naïve, or simply takes promotional press stories at face value without further inquiry. It is one thing to be wrong because you made a mistake. It is quite another thing to be wrong because you had no basis for even making an assertion that you were right. Of course, Hawking played down the fact that he was wrong and the liberal media has always given him a free pass at every stage of his career. Good riddance to Hawking; a truly loathsome human being. Being a genius does not necessarily mean common sense. As usual Debbie you’ve got it right. Thanks. Naomi, that’s true. But it’s also true that Hawking is no genius. And, more important, Hawking himself knows that he’s no genius. The underlying reason he’s boycotting Israel is because it gives him a boost in the Leftist media at gives him a way to attempt to be “superior,” when, in fact, he knows that he is inferior in every way to the Israeli and other Jewish scientists. For example, Jacob Bekenstein, an Israeli scientist, was the first to suggest that black holes should have a well-defined entropy. Bekenstein also formulated the generalized second law of thermodynamics, black hole thermodynamics, for systems including black holes. Hawking originally took the position that Bekenstein’s groundbreaking research was wrong, even though Hawking did no work or research of his own. Eventually, though, Hawking begrudgingly acknowledged that Bekenstein’s conclusions were correct, though Hawking made no public apologies for his complete lack of integrity and his total failure as a scientist. This is very discouraging. Apparently, he’s just another dhimmi Brit, brilliant or not. Given his condition, maybe it can simply be attributed to brain damage. A cryin’ shame that he’s going the opposite direction of other scientists regarding Islam. I mean, how obvious is it what Islam is? He probably doesn’t even realize that he’d be a high profile target for Islamists to take out, somebody they could scream about murdering for centuries, had he attended this conference. And, 50+- years of life he probably wouldn’t otherwise have had except for Jewish science and medicine. As Bugs Bunny always said … What a maroon! The next time he needs medical treatment to remain alive let him go to Baghdad for care. I have seen references that the device he uses to speak was designed in Israel. If so, let him boycott that. The reason why Stephen Hawking is famous is because of media. His popularity has NOTHING to do with his scientific contributions but is merely because of the pop science books he was written. He is just one of the pop science idols like Michio Kaku and Neil deGrasse Tyson, who are famous because the number of times they appeared on tv and the quality of papers they have published. There are hundreds of pther living physicists who scientific contribution is atleast as great as that of Hawking , if not more. Everbody has heard about Hawking? But what about Jocaob Bkenstein? do people realize it’s actually called Hawking-Bekenstein entropy? And what about other great living physicists like Steven Weinberg, Sheldon Glashow, David Gross, Frank Wilcez, Gell-Man Murray, Hugh David Politzer, Kenneth G Wilson, Gerard ‘t Hooft, Edward Witten and hundreds of other theoretical physicists? Why does the media completely ignores them while elevating Hawking to the level of superstar ? I’ve wondered about that. For those of us who know nothing about physics, the publicity he has been receiving for slowly typing out supposedly brilliant and profound insights might just mean we’re all receiving a big, media-driven snow job. I’ve wondered if we would make such a big deal about this guy if he were not disabled. He reminds me of so many other Britons who became Israel-haters late in life–Bertrand Russell and, I think, Arnold Toynbee, come to mind. They caused so much consternation when they did. Well, guess what–they’re long gone, nobody cares what they said 30 or 40 years ago, and Israel is still here and flourishing. The same will happen with Hawking. He probably won’t be around much longer, given his age and health.He’ll be remembered as the curious, disabled man who used to electronically emit supposed profundities about planets. It might influence a few dozen other obscure academics to call for Israel’s elimination, but it will have absolutely no effect on Israel’s well-being and existence. Personally I’m happier Barbara Streisand and Madonna come to Israel! SH can’t sing or dance and we have our own naviim so who needs his futurisms? 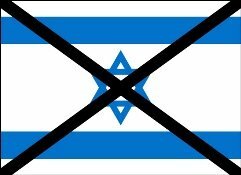 After all the goyim have thrown at the Jews from slavery, expulsions, annihilations, forced conversions, extermination camps, etc., does anyone believe that boycotts and disinvestments are going to drive Israel into the sea? Screw them. When France launched its arms boycott, we developed our own arms industry for self protection and now export so the goyim can kill each other more efficiently. When they would not let us practice medicine in their lilly white hospitals, we built a nation leading the world in bio-tech and medicine. Without Intel Israel, Sh would not be able to “speak” via his computers because the chip was developed in ISRAEL. We should recall it and shut him up! Intel is an American company founded and based in California. The two founders, and the president and CEO are Americans (and not Jewish like some believe). Outside California, the company has facilities in 63 countries and regions internationally. Anything manufactured or developed in their facilities around the world is still American technology. It seems some Israelis like to claim Intel is an Israeli company, because Intel has a R&D and manufacturing plant there with 8k (soon to be 9.5k) employees. For comparison, Ohio has 15k Intel employees. But why mind the facts when you can make yourselves look like fools with baseless insults at a man you couldn’t even hold a candle to? Lol, “Chiam,” you can’t even spell “your” name? Maybe it’s Dr. Hawking himself. Grunt if it is. The number of employees is irrelevant. We all know where the serious R&D is taking place, and who is mainly doing it. “Chiam,” we get the picture. You hate Jews and Israel. Why not just say that? At least that statement would be true? As for Intel, if you really knew anything about the history of this company, you would know that it started to become the technological powerhouse that it is today thanks to three extraordinary. visionary engineers: Gordon Moore, Robert Noyce, and Andy Grove. Regarding the religious/ethnic categories of these three top players: Moore is not a Jew, Noyce was known to be an agnostic, and Grove was a Jew. Grove was, in fact, a Hungarian Jew, born in Budapest. I have posted about Hungarian Jews before, and they were among the greatest minds and talents that the world has ever seen, and have played a vital role in our civilization. It was not for nothing that the Nazis wanted to destroy the Hungarian Jewish populations because the Nazis were dedicated to the destruction of civilization as well. Just a few factual tidbits of note: (1) Seven our of ten Nobel prize winners who were born in Hungary were Jews; (2) The US Government brought in the greatest physicists in the world to develop the nuclear bomb before the Nazis did, three of whom were Hungarian Jews: John von Neumann, Leo Szilard, and Eugene Wigner (as well as several other Jews who were not Hungarian); and (3) some of the world’s greatest inventors were Hungarian Jews, including Peter Goldmark (inventor of long-playing records), Laszlo Biro (inventor of the ballpoint pen), and Dennis Gabor (inventor of holography. Andy Grove comes from that great tradtion. You might also be interested to know that Steve Jobs of Apple idolized Grove and often asked him for advice. Here’s a picture of the three individuals that led Intel to be a great company: Andy Grove, Robert Noyce, and Gordon Moore (from left to right). Note that Grove is the casual dresser of the three, setting the entire standard for Silicon Valley. and hang it up on your wall. In case nobody has noticed, Israel seems to be doing just fine in the field of physics, chemistry, science and technology without Stephen Hawking. He denies that there is a God despite the fact that scientific knowledge confirms intelligent designing of the universe, our galaxy, our earth, all life including human beings. So if you deny there is a God, then why not deny any importance to Israel? Just because someone is intelligent doesn’t make him or her smart. Just to clarify a point: “scientific knowledge confirms” no such thing. That ARROGANT little freak. Genius? More like an ant! He should be crushed for his anti-semitic ideals! Such biggotry is appaling, I can’t hardly breathe thinking bigots like him are teaching in academic establishments. He should know better than spread hateful lies about jews. Jews know no wrong! …Black Hole meet S. Hawkins. S. Hawkins meet Black Hole. Remember that common sense isn’t. Being a genius does not mean his BS meter works. People like Chomsky and Finklestein will lie to him and he will accept their word for it. Of course, lying academics is proverbial. How many papers get flagged for false data and plagiarized research?? Fame and fortune is a powerful thing. Valuable information shared..Iam content to read this report..thanks for offering us wonderful info.Fantastic walk-through. I understand why post. Wow. I dont klike Mr. Hawkings but to say he is a nazi because he wants to boycott a terrorist regime like Israel is pathetic. Only you Israel firsters would try to call someone a anti-semite or terrorist lover because god forbid someone dislike Israels occupation of a country THAT IS AND NEVER WAS THEIRS! Very good!! Everyone know how blood suckers Israelis are! The whole world must boycott Israel, they are inhuman! The G-d Particle was discovered, and Hawking’s reputation went in the toilet. The best thing that ever happened to Hawking was ALS.